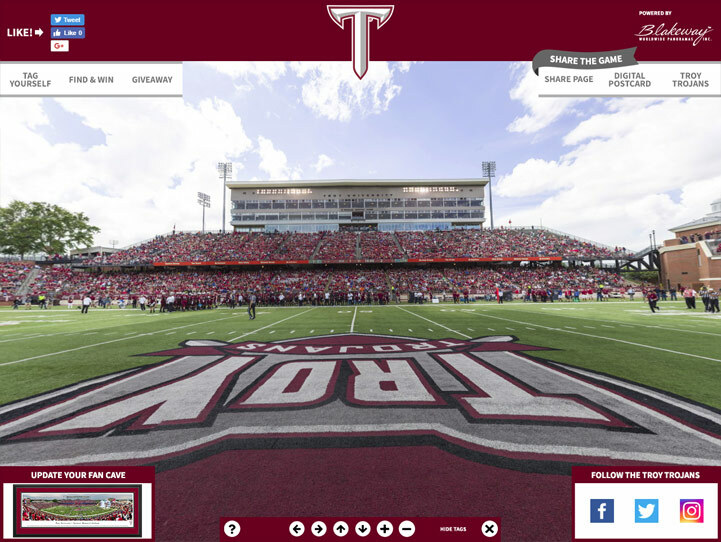 This panorama of Larry Blakeney Field at Veterans Memorial Stadium, commonly referred to as The Vet, spotlights the Troy University Trojans™ football team playing in front of the largest crowd in the history of the program. The Vet has seen tremendous change and growth since its construction in 1950, including recent renovations which have kept pace with the Trojans football program's rise in prominence, including 3 national championships and numerous conference championships. Trojan fans have also shown their support, consistently setting single-season attendance records at Veterans Memorial Stadium. Show your team spirit with a Blakeway Panoramas game-day print. Our state-of-the-art cameras capture amazing high definition photos from carefully researched vantage points inside the stadiums and arenas that are so clear and life-like, you'll feel like you were there. These officially licensed, Made in the USA, large panoramic prints proclaim your allegiance to your team while creating a focal point in the home, office or fan cave. They also make the perfect gift for the sports fan in your life. To take that home, office or fan cave décor from ordinary to extraordinary, check out our affordable framing options. We buy our framing supplies in bulk and pass that savings on to you, so our prices are almost always lower than frame shops. It's the perfect way to celebrate your team while extending the life of your Blakeway Panoramas print and showcasing your fandom for all to see. Were you at this game? Visit our 360° fan photo and see if you can find yourself! Our panoramic prints begin as a high definition photo that is printed with UV resistant ink on heavy art stock. These are available unframed or in 3 frame styles. Before framing, we mount it and secure the panoramic print to a backer board to prevent waviness and warping due to heat and humidity. If you choose a select or deluxe frame with matting, the mats used are pH neutral to protect against degradation of the photo and the colors used match the team or school style guides.